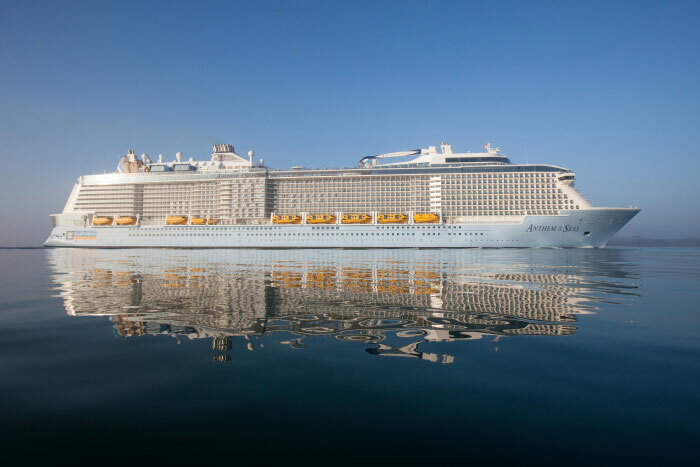 Anthem of the Seas has arrived at Southampton, UK ready for its inaugural cruises, christening and just showing off all its innovative features! Royal Caribbeans newest cruise ship arrived into Southampton, UK today at around 8 AM under a gorgeous early morning blue sky. The 168,666 gross ton vessel is now preparing for a christening ceremony on April 20th which is just weeks after P&O Britannia was christened by the her majesty the Queen. Anthem of the Seas godmother and travel agent Emma Wilby from Sunderland, UK also met the new vessel which also begins a busy few days with ship visits by cruise professionals and the media. the vessel will show off all the brand new features that have already been experienced by many cruisers on sister ship Quantum of the Seas. Some highlights include Two70, Robotic bartenders, North Star, SeaPlex and of course the new Ripcord by iFLY. passengers from the UK will be among the very first to try out all these amazing new onboard features not to mention the fastest Wi-Fi at sea! The ship was built by Meyer Werft in Papenburg, Germany and now the shipyard is constructing the third vessel in the same class named Ovation of the Seas. Cruise Hive will keep readers informed of the cruise industry’s newest cruise ship including the christening on April 20th.